What is it about what we had together that prompts - even compels - us to reconnect? 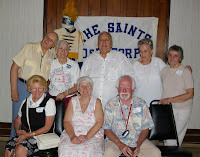 Our time marching with the Saints, for many of us, represented our only corps membership experience. Some enriched our ranks having marched other places, and others moved on to other corps (either junior or senior) after leaving. 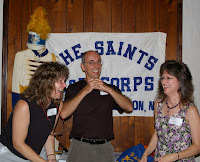 There's something about our shared experiences as Saints that, 41 years after we started and 31 years after we last fielded a corps, still pulls us together in ways corps today just don't. It even evokes an incredibly deep Guest Book posting from the person who's arguably the instructor most closely identified with our summer successes. Whatever it is, I'm glad for what it is, and I'm glad you continue to stop by Scribblings for a visit. I'm as excited to see how many of you pop in to check out what's going on here as you might be when there's a new posting. Thanks for being part of my family. See you at the next Reunion, if not before. There were also some 30 main squeezes, children, and others who joined us to share in at least part of the day's activities. We were glad to have you with us! If you took pictures last weekend, make sure to send them to Rocky to post on the website. 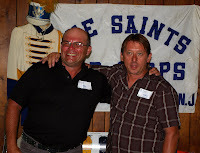 Check out Gallery 13 on the Saints website for photos already posted. Those of us who were at Sewaren Park and / or AL Post 471 in Iselin over the weekend will be able to name all the people in our section photos (well, probably) - for the rest of you, have fun guessing! In most browsers, a simple click on any of the images will enlarge them. Keep watching www.saintsdrumcorps.com as more pictures are posted from the weekend. Man, oh, man, where to begin? 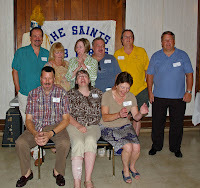 First, some shout-outs ... the Reunion Committee (what a crew you all are! ), Mike the Caterer at Sewaren (not to be confused with Warren) Park, our ever-supportive family at Post 471 (extra thanks for bailing us out on the need for ice at the picnic! ), and on a personal note, to Leslie and the staff at Somerset Medical Center for sewing me back together in time to see all of you yesterday. Sometime over the next couple of days, I'll compile a list of everyone who joined us over the weekend. For now, I just wanted to make sure I had something out here for all of you to read (especially you, Mickey, when you get back to work on Monday!). Someone asked me last evening what could be done to pay back the Reunion Committee in some way for all the work that was done - if I wasn't clear about it then, I will be now: HELP PLAN THE NEXT ONE. Finally, a bit on legacy passed down from one generation to the next ... we had the privilege to honor Ray "Mr. C" Chmieleski, Uncle Tony Fastuca, and Alvina "Mrs. Chez" Chesnovitz last evening for their "actions (which) served to foster a corps family which still enjoys, over 40 years later, the days when the Saints came marching in." Among the many lessons they and all the other supporting parents shared, we learned generosity of spirit. For those joining us at Sewaren Park - the weather promises to rival the hottest, sunniest, most humid day we ever marched together. Come prepared with sunscreen, and if possible, lawn chairs (the pavilion provides shade and is large enough for all of us, but is skimpy on seating). If you're planning on paying us when you arrive on Saturday, BRING CASH (or, if absolutely necessary, a check payable to Althea Mazar). If you've already registered, contact saintsreunion@gmail.com. Directions are out on the Saints website at www.saintsdrumcorps.com.